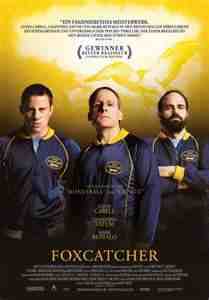 “Foxcatcher” will probably go down in my book of 2014 as the most disappointing movie of the year. There has been so much positive talk of the film, particularly of Steve Carell’s playing of John du Pont that seems will change the direction of his career, that I found that to be the jaw dropping aspect of the whole movie. He is not playing funny but he is playing monotone, no smile, seriousness. Maybe du Pont had that kind of personality but it doesn’t help the movie. The editing is some of the worse I have ever seen. I don’t know if it was the director’s, Bennett Miller, choice but there are 5 too many blurry scenes and more than that of unnecessary long shots that made the picture drag at over 2 hours. The writers, E. Max Frye and Dan Futterman, leave so much out about du Pont that his final act doesn’t make any sense. Based on a true story, though they show du Pont inhaling cocaine and having drinks, they never show that he was mentally ill. Yes they do show an unfeeling mother but they never reference the sisters and brother he had inferring that he was an only child. Channing Tatum, as Mark Schultz, is an Olympic gold winner, more or less the jock presented as a ‘dumb ox’, more than once called an ‘ape’. He really does an excellent job and has a couple of self brutalizing scenes. Mark Ruffalo, as his older brother Dave is also a gold middle winner and the only one in the film who has a happy home life with a wife and 2 children who come first in his life. By the way their medals are in wrestling and you can get bored watching two somewhat hunky guys grappling with each other in two scenes too many, none of the scenes equaling the wrestling scene in “Women In Love” movie! In an emotional story like this with the lead being emotionless, and only seeing someone being self destructive getting a response from the audience, made this a very disappointing film to me.